Parkinson’s symptoms such as hand tremors and weakness can make daily tasks a challenge for seniors with this condition. The Parkinson’s care Harrisburg seniors appreciate involves finding creative ways to better manage these symptoms. The most thoughtful gifts you can give your elderly loved one, besides your compassionate time, are products that can help make life easier. Holding a book steady enough to read can be a challenge for seniors with Parkinson’s, but a specially designed holder can help. These are available in many designs, including tabletop versions and adjustable stands. Choose a style with page holding tabs so your loved one has an easier time keeping the book open. Technology brings benefits for seniors by making reading material more accessible. E-readers have options for making the print larger and easier to read. Many seniors with Parkinson’s will find flipping pages at the touch of a button or touch of the screen easier than turning pages of traditional paper books. Rising from a seated position is often difficult for seniors with balance issues or muscle weakness. These cushions provide a way to easily turn in a chair so a railing, table ledge, or other steadying support can be grasped when rising. This can help your loved one feel more confident dining at a table, and the cushion can be transferred to other seats if needed, including vehicle seats. It is easy to take small tasks such as writing for granted, but tremulous hands can make this task more difficult. Give your loved one more confidence with writing by giving him or her a pen specifically designed for seniors with Parkinson’s. The unique design allows steadier writing in spite of tremors. These are made specifically for seniors with Parkinson’s and those with tremors due to other causes. The weighted handles help stabilize the hand, making eating meals less frustrating. The handles are also oversized, which makes them easier for your loved one to grasp. One of the greatest gifts to help your loved one manage Parkinson’s is the companionship of a professional caregiver. For trusted Harrisburg elder care, turn to Home Care Assistance. 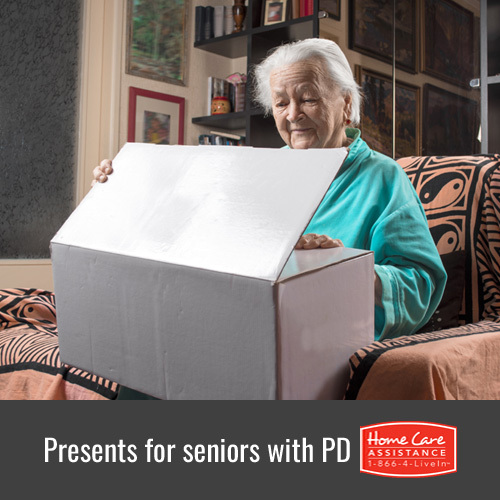 Our caregivers are expertly trained to assist seniors with mobility, cooking, cleaning, and much more. For more information on our senior care services, call one of our qualified Care Managers at (717) 540-4663 to schedule a complimentary in-home consultation.